Is Chinese the World's Hardest Language? You've probably heard somewhere before that Chinese is the “hardest” language in the world. There is a seemingly endless amount of information on the web describing the “formidable” and “daunting” task of getting anywhere with Chinese, which discourages many aspiring learners. However, by what standards should we consider Chinese the hardest language? In practice, learning Mandarin isn't as hard as it seems. In fact, most of these assumptions are based on the way a scholar would approach learning the language, rather than ways that suit most people's real life learning objectives. One of the easiest things to point out about the difficulty of learning Chinese is how many characters there are. It is true that to be able to learn Chinese at a proficient level, you need to know about 2500-3000 characters. However, the challenge of getting to this point is exaggerated by people who refer to the traditional methods of learning Chinese as the only way to learn Chinese, starting with the basics of stroke order and handwriting skill. However, the present day reality is that typing is a whole lot more important in daily life than handwriting. Don’t get me wrong – learning how to write Chinese characters the same way kids in the Chinese school system do is an admirable effort – I just don’t think that it's a necessary step for everyone to take. Without taking anything away from the rewarding experience of learning how to write Chinese characters, technology is an important means of communication in China, and typing in Chinese makes the learning process a whole lot easier. All you need to be able to type in Chinese is to be able to spell out the pinyin of the word you wish to type, and be able to pick out the character from a list. When comparing the respective difficulties of handwriting and reading Chinese characters, doing away with the stroke order bit is going to save you at least half your time. In fact, many literate Chinese, despite having memorized stroke orders as children, have trouble recalling how to write even basic characters in adulthood. Once you type its pinyin, your computer or device will guess the character you would like to use and provide a list of top suggestions to choose from. The accuracy of the computer’s suggestions is also significantly increased by the context of what you are typing. If the computer doesn’t guess it correctly, you can scroll through the list of characters corresponding to that pinyin, and as long as you have a rough idea of what the looks like, it's not too hard to pick it out. If you are typing a compound word or even a sentence, the computer gets even better at guessing. While it does take some time to get to that 2500-3000 character pocket so you can start to converse like a native, typing also helps you get there. There will be times when you don’t know what a character looks like, but have heard it before so you know the pinyin. Your input system is really good at letting you know what that character is based on the context of the surrounding characters, as well as your typing history. Furthermore, when someone sends you a message with some characters you don’t know, the dictionary definition is just a copy and paste away using a dictionary app. In much the same way that a computer can guess what word you want to type, much of Chinese is discernable to the ear if there is enough context to go by. Native Chinese speakers – even those who have never previously spoken with foreigners – can usually make out what you are trying to say even if you butcher your tones. This brings me to my next point, which is that your spoken Chinese will NOT be totally incomprehensible if you don't get the tones perfect. Often, native Chinese speakers will also neglect to enunciate their tones without losing confidence they will be understood by their audience. Chinese songs usually lack tones, but listeners can still understand their meaning because of the context. It is probably easiest for English speakers to complain about the tones, since we have nothing comparable in our language. While any serious Chinese learner has the unavoidable task of persistent tone practice and should give attentive care to learn the tones of new vocabulary words, difficulty with tones should by no means prevent you from steaming ahead with your learning process. Chinese is a logical and straightforward language, in terms of both grammar and vocabulary. Grammar rules are pretty lax compared to English, French, and Spanish. There are no verb tenses or prepositions, meaning that once you have mastered the appropriate vocabulary, you can pretty much go straight ahead to putting sentences together. The lack of grammar rules is especially true for spoken language, which gets rid of a lot of the fear factor involved in speaking a new language since you don’t need to worry about syntax. Chinese also follows the subject-verb-object order of the sentence that English goes by. Speaking Chinese in an eloquent way does involve grammar rules, but as a Chinese learner, people will have more patience with you, and you can generally get across what you want to say with relatively few stumbling blocks. Chinese vocab is similar to German in that it directly mashes simpler words together to make complex or compound words, making vocabulary learning an intuitive experience. Take for instance telephone (电话 diànhuà), a simple combination of electric (电 diàn) and talk (话 huà). 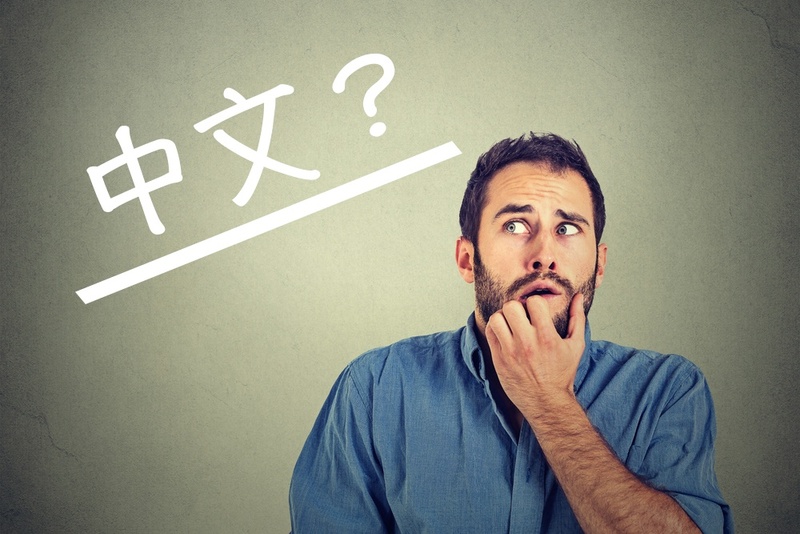 Once you've learned 电 and 话, there is plenty of reference to aid you should you forget 电话. Compare the mnemonic aids here to what "telephone" offers English speakers. It is hardly likely that an English learner would associate "telephone" with "tele" (far, away) or "phone" (sound, voice). To make things even easier for those of an English-speaking background, many Chinese words are cognates borrowed from English, such as bus 巴士 (bāshì). There are also many hybridizations that are both cognates and Chinese words themselves. The cognate 拜拜 (bàibài) simultaneously means "bye-bye" as in English, as well as to give one's blessings in the Buddhist sense of 拜佛 (bàifó), or pray for good luck. Other words are direct translations of English words, such as supermarket, which is super (超 chāo) plus market (市 shì), or 超市. All languages have their respective difficulties, and difficulty is generally judged by how different your native language is from the language you are learning. In the case of Chinese, students who already know Korean, Japanese, or Vietnamese will have less difficulty learning than those coming from Romance language countries. However, while these students appear to have the advantage in picking up Chinese, the experience of language learning also gets richer the more distant the language from your native tongue. Language accompanies culture, so when you are learning Chinese, you are also opening doors for yourself to understand a completely different way of seeing the world. The cultural novelty of Chinese makes the learning process arguably more exhilarating to Western students, which in my opinion, evens out the playing field between Asian and Western Chinese learners. The claim that any particular language is more “difficult” than the others is problematic since difficulties are subject to an individual's language learning background and degree of interest in the language. If you have never studied an Asian language before, learning Chinese is going to be a memorable experience because of the vast cultural differences that are being bridged in the act of learning the language. In my experience, the greatest difficulty I came across learning Chinese was overcoming my own feelings of discouragement, and my presumptions and fears about the “formidable” task of learning Chinese. Perhaps those who complain about the hurdles of learning Mandarin never themselves got out of the classroom to actually practice it with real people, or perhaps they just want to extoll the scale of their own accomplishments in “conquering the world’s most difficult language”. Don’t listen to these guys, as the most important factor in learning a language is your attitude towards it. Language is fundamentally about connecting with people, so what you put into Chinese is what you will get out of it. The arguments about how difficult Chinese is are based more on looking at the language from an academic standpoint than actual application in real life, and thus are not grounded in the reality of learning Chinese. Technically, Chinese is up there with Japanese, Russian, Arabic, Korean, and other as the hardest languages in the world. However, for my experience, once I learned how to use technology, and in general apply myself with a proper attitude, there really wasn’t anything more difficult for me in learning Chinese than there was in high school French. One thing is for certain – learning Chinese takes frequent, interpersonal practice. Once you have found the appropriate interactive learning environment, you can begin to make use of the mnemonic devices and technological aids that make Chinese just as “easy” as any other language.